A cultural lag. For many years education leaders have been pointing out the flaws in this top-down, mean-spirited, child and teacher damaging, ideological, and harmful nonsense laid on our schools. 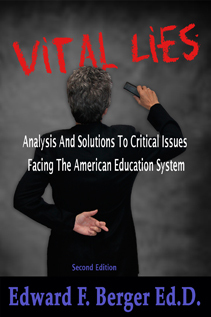 The USDOE has given access to the top levels of our education leadership and policy making to people who have never been vetted or elected, have no experience, no certification, nothing but massive amounts of money they use to force their half-baked ideas on America. The use of mandates by a government agency that is forbidden from mandating is especially damaging. The power given to profiteers and to those who want access to the tax dollars we pay for our schools has damaged hundreds of thousands of students, teachers, communities, and families. Opening the doors to the likes of Eli Broad and his totally irresponsible take-over of administrator training and thus public schools is an example of the deforming of a system that once required certification and vetting before letting anyone loose on children. Arne Duncan, a failed administrator and completely out-of-touch Secretary of Education, has give over to self-appointed “reformers”like Bill and Melinda Gates and a murder of other crows who think they can kill our public schools and create a new market-based, segregated system geared to wealthy white people, while using data that is almost meaningless to destroy teachers, communities, and schools with no regard as to what happens to children. The Billionaire Boys Club (Including Waltons and a few opportunistic women like Michelle Rhee, Eva Moskowitz, and Wendy Kopp), have ways of using our tax sheltered Foundations to direct dollars they should have been paying to evolve and support public schools, into their own ego-driven ideologies and “entitled” brain farts.